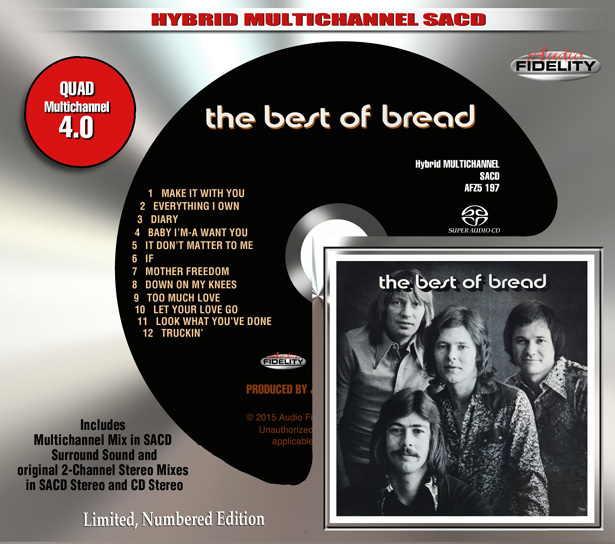 Camarillo, CA – With many exciting releases scheduled throughout 2015, Marshall Blonstein’s Audio Fidelity starts the New Year off with the release of soft rock legends Bread “The Best of Bread” on 4.0 Quadraphonic Hybrid SACD! This 1973 recording is a great collection of music from Bread, the popular 1970’s band best known for their mellow, smooth, melodic and often mournful tunes. Many of the classic Bread tunes included in this set live on through soft rock stations everywhere. Lead singer David Gates crooned his way into America’s heart, and starting with “Make It With You” quickly spun off hits like “Everything I Own,” “Diary,” “Baby I’m A Want You,” “It Don’t Matter To Me” and “If.” At times, their songs had a more upbeat feel as with “Mother Freedom,” but they always retain that same soothing blend of soulful lyrics and gentle music. This album covers all the early hits and more delivered with a deceptively breezy tone by one of pop’s purest vocalists. Audio Fidelity reassembled all the original masters of the tracks that appeared on the album release rather than work from the compiled “Best of…” master thus giving the recording a completely fresh, updated sound. This entry was posted on Wednesday, January 14th, 2015 at 22:16	and posted in Bread, Press Release, SACD. You can follow any responses to this entry through the RSS 2.0 feed. « Legendary Blues Guitarist Harvey “The Snake” Mandel Releases Early Solo Albums In 6CD Box Set!